Snowboarding used to be easy: slap an aluminum disk or cardboard box on a snowy hill and off you went, but no longer - now it is important to buy a snowboard to suit the type of boarding you prefer as well as your body style. By choosing the right board, you maximize your performance while minimizing problems and potential accidents. Freeride: These are good all-mountain, park, and halfpipe boards designed to float well on powder. They are the most popular type of snowboard and are great for beginners and enthusiasts alike. Freestyle: These boards are great for flashy jumps, spins, tricks and half pipes. They are more flexible and have greater maneuverability, making them suitable for beginners as well. Freecarve: These boards are good for serious competitors who do a lot of hard carving (wide, deep curves and turns at high speeds) but little jumping. They are longer and stiffer to hold the curves easily, and are generally narrower than other boards. Backcountry: These boards are similar to freeride styles but are more durable and suitable for all types of snow, including fresh powder as well as packed slopes. Women's / Kids': With the same general characteristics as other boards, these specialized designs are proportionally designed for women's and kids' bodies just as other sporting gear is proportional to different genders and ages. Once you understand the differences between types of boards, you can choose a style that matches how you like to ride, and you can focus on how to buy that specific type of board. Rent or borrow a snowboard before you buy, because the design of different boards as well as your size and weight will directly affect your buying decisions. For beginning riders, it is always better to rent first to try a range of models and brands and to determine your best riding style. Local Ski and snowboard shops can provide hands-on information regarding conditions, styles and gear. By doing a few snowboard runs with different models, you'll quickly determine what works for you. More than just your preferred ride and physique affect how to buy a snowboard. Because the boards are engineered to perform in a specific way, knowing how their anatomy affects the ride can help you determine which type to buy. Proper length generally is a board that is about even with your chin or mouth when you stand the snowboard on end. Deep powder and race boards will be longer in order to provide more stability, while freestyle boards will be shorter for greater maneuverability. The width, or waist, of the board is measured across the skinniest section. The size of the board should match the size of your feet when you stand in riding position. Put on your boots and stand on the board, and your boots should be flush with the edges. If your toes extend too far, they will drag and slow the board, possibly causing accidents, but if the board is too wide, turning will be too difficult because you will be unable to put adequate pressure on the edge. A bad board choice can mean a bad fall. Snowboards require flexibility for safe and speedy rides. A flexible board has greater maneuverability, while a stiffer board can hold graceful curves more smoothly. Torsional flex, measured across the width of a snowboard, determines how well a board will hold on its edge. More torsional flex will make the snowboard easier to twist to make sharper turns, but too much requires maximum effort to turn. Longitudinal flex measures your snowboard's flexibility end-to-end. Balanced longitudinal flex allows you to carve turns evenly. A board having unbalanced flex allows for quick shifts to the other edge of the board and faster acceleration out of turns. Sidecut depth determines your ability to turn. Shallow sidecuts are good for long, sweeping turns, providing easier and better maneuverability, good for mountain snowboarding. Deeper sidecuts provide easier and faster turns, best for freestyle and tricks. A rider must feel comfortable on their board, and generally the rider's height and weight factor in to how to buy a snowboard. A taller, heavier rider will need a longer, stiffer board to accommodate their physique, while a lighter, smaller rider needs a sufficiently light board they can control. When you buy a snowboard you're buying more than a single piece of equipment. You'll need boots costing from $90- $200, for example. Make sure the boots fit your snowboard's bindings and can easily be attached, and they should fit snugly at the calf and heel without crushing your toes. Try boots on while wearing a medium-weight sock. If you require very large boots, consider purchasing a wider-than-average board to prevent your toes from dragging in the snow. 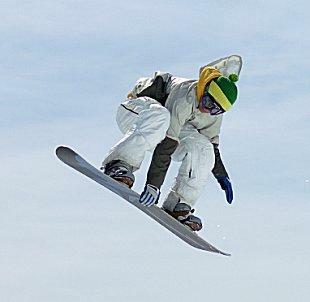 Gloves that are flexible enough to provide grip without loss of sensitivity, particularly for freestyle boarding. Goggles that fit snuggly and don't fog up easily, especially for curving and banking through new snow. Outerwear clothing (coat, ski suit, etc.) that is comfortable but loose enough not to restrict the rider's movement and balance. Expect to pay $100-$600 for a snowboard. There is a range of materials for different riding preferences and abilities, and many manufacturers offer more expensive "signature series" boards designed by professional riders with their preferred materials and configurations. Boards with customized graphics or designs will likewise have higher price tags, but it is possible to buy used boards through online auctions, used equipment stores, and classified ads. When buying a used board, examine it carefully for cracks, chips, and other damage that could impair the performance, and test it out before purchasing it if possible. 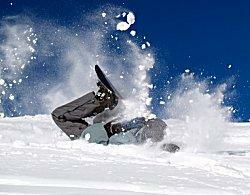 For more information, investigate individual snowboard manufacturers and retailers for guidelines and recommendations. Snowboarding.com offers a comprehensive guide on various aspects of the sport, and by becoming a knowledgeable consumer, buying a board will be the least challenging trick of all. Backcountry.com: Freeride, freestyle, kids', split, and women's snowboards. the-house.com: Snowboard Shop: Factory-direct pricing on the hottest brands of snowboards on the market, goggles, instructional and professional DVDs, bags, and other equipment.